Israel’s swap of 1 IDF soldier for over 1,000 Palestinian prisoners raises serious questions regarding the likelihood of future terrorist acts carried out by this group, which includes known bombers and murders. Instead of continuing to get mad without becoming articulate, the movement should get educated and then target the lawmakers who enabled the banks to stuff themselves on the taxpayer’s dime. It’s easy to direct anger to big corporations that pay fat bonuses but the truth is a disciplined approach would go after lawmakers who need to be re-elected. Maybe protestors don’t think that they can scare lawmakers into listening but given the no-holds-barred tactics and successes of the Tea Party, Occupy would be wise to take an aggressive stance with the left. Immigrant detainees with disabilities are left to provide their own counsel in court proceedings, leading to unfairly negative outcomes in immigration court. The policy behind preventing patents on human components has received bipartisan support but its application is flawed when Congress focuses on embryos to the detriment of other areas worthy of protection or at least consideration of protection. It seems inconsistent to allow patents derived from stem cells (most often taken from leftover IVF embryos) but not allow a patent from the embryo itself. If the AIA was truly meant to protect human life, it most likely would have included more robust IP restrictions. Perhaps the act will be subject to later amendments but as it stands now only the golden calf of embryos have found sanctuary from patent law. Video footage depicting a two-year old girl in China being run over twice by the same mini-van driver, and then once again by a light truck – while as many as 18 passersby ignored her plight – has sparked off the latest round of moral outcry and introspective reflection on modern societies’ lack of a sense of community. What role can the law play in structuring a more compassionate society? 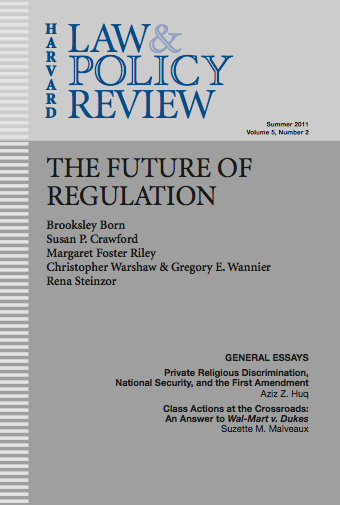 The HLPR Blog explores law and policy from new angles. Our bloggers are progressive law students and lawyers from around the country. Money in Politics, Citizens United and the Path Ahead – Where to Start?